With December coming to a close, you’ve likely thought about how you will be ringing in the New Year. Maybe you’ll be spending New Year’s Eve at home with family, at a holiday party with friends, or (if you’re very lucky!) in the heart of Times Square. For nonprofits, it’s only fair (and smart) to spread along the festive cheer and celebration to their fundraising communities. January is the perfect time to celebrate with your supporters, reignite passions for your cause, and strengthen donor relationships. It provides an opportunity to improve donor stewardship by being spontaneous and creating fresh, positive emotional associations with your brand. In other words, it’s time to go out of your way and deliver some donor delight! If you haven’t brainstormed ways to surprise or inspire your supporters this January, fear not. We’ve conjured up a few ideas to get you started. Here are 4 creative ways to delight your supporters and encourage them to make a difference in 2015. Many nonprofits make the effort to add a personal touch to their emails, social media posts, and other communications all year round. However, you can really go above and beyond expectations by letting supporters meet the faces behind those messages. Instead of making asks or talking about people in need, start the year by introducing your staff to your fundraising community. Lift the curtains to your organization and remind supporters there are real people, with real personalities, behind your cause. It humanizes your brand tremendously. The organizational program he or she is most passionate about and, most importantly, why they’ve joined your organization. That last bit helps get donors excited about your work, while helping them get to know your team on a more personal level. A face-to-face introduction like this can do wonders in strengthening your organization’s donor relationships. All your supporters should get a friendly New Year’s greeting, but your new blog or newsletter subscribers deserve a special hello. They’ve just decided to walk through your door, so it’s important to let them know you appreciate having them in your community. After signing up, most will expect a typical auto-confirmation email. So how unexpectedly awesome would it be to receive a personalized message instead? 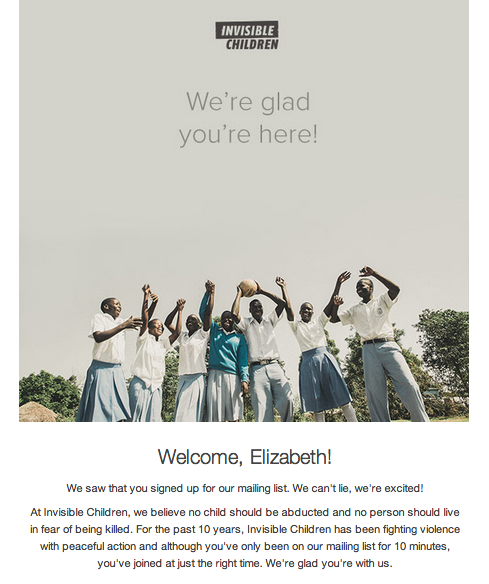 I’ve mentioned it before, but Invisible Children won major points when I received this email after signing up for their newsletter. Not only did the copy get me excited about joining their mission, but the added personality was a meaningful gesture that instantly set them apart from other organizations I’ve subscribed to. Welcome them to your community, and express your excitement to spend 2015 with them! Tip: Make sure to add social share buttons so they can connect with you in other ways. People often set New Year’s resolutions to celebrate fresh starts and commit to self-improvement. Come January first, many of your supporters will probably make one for themselves. Why not get in on the fun and share this tradition with your community? Idea #1: Send supporters an upbeat video in which you share your organization’s “New Year’s resolution” for 2015. What are you planning to accomplish in the following months? Are there any specific projects that set this year apart? How will they impact your overall mission? Are there any changes you’ll be making to your programs? Invite supporters to help you make this year the best one yet. And, as a little teaser, sign off by telling viewers to stay tuned for more updates. Build up anticipation and get supporters excited to be a part of all that’s in store for the year. Idea #2: Nothing connects supporters to your cause like a video of the people you serve. As a donor, it would be nice to get a short vlog (video blog) by a beneficiary in my inbox. But a video of beneficiaries sharing their personal New Year’s resolutions with me? Now that’s something I wouldn’t expect! If it’s within your reach, try compiling and emailing out a short, feel-good video of constituents sharing their hopes and goals for 2015. A positive video like this can move supporters to want to support your programs any way they can. This is a festive way to highlight the people you serve, without directly asking for donations. You’ll also be fostering a direct connection between supporters and the impact of your programs. For-profit companies will often delight their customers by giving them something they don’t expect, whether it’s an exclusive discount, free upgrade, or complimentary products. Obviously, nonprofits can’t really offer the same things (or, at least, to the same extent). However, there is one thing they can give to their supporters: access. The Idea: Of course, supporters should feel like they can check in with your organization anytime of the year. But, much like how a Q&A panel with a celebrity feels, you can heighten this sense of access by offering a specific opportunity for supporters to chat with you and ask anything they’d like. Consider setting up an “Ask Me Anything” session on Twitter. Announce over email and Twitter that for a scheduled hour or two, supporters can tweet any and all questions about your organization. You can even create a specific hashtag so followers can check out all your answers. Later or easily follow the conversation live. These kinds of AMA sessions can give your organization an opportunity to show some personality and give supporters a behind the scenes look at all the work you do. Giving your supporters some face time will make them feel valued, demonstrate your willingness to be transparent, and engage your community in an unexpected way! Start off the New Year right. Put in the extra effort to exceed supporters’ expectations from the start, even in little ways; you’d be surprised how much the details really matter. With delight delivery as your priority, you’ll improve your chances of solidifying lifelong donor relationships!